Coconut cupcakes with coconut cream cheese frosting. 1 cup flax seed meal. Add the eggs, oil, and coconut extract. Mix well. Add enough water to make a thick batter, usually about 1/4 to 1/2 cup. Thoroughly coat a muffin pan with non-stick cooking spray. Remove and let cool before removing from the pan. optional: 1 tsp coconut extract. Optional: food coloring to desired color. Using a pastry blender, combine the cream cheese and butter. Continue blending until well mixed. Top the cupcakes with a generous helping of the frosting. 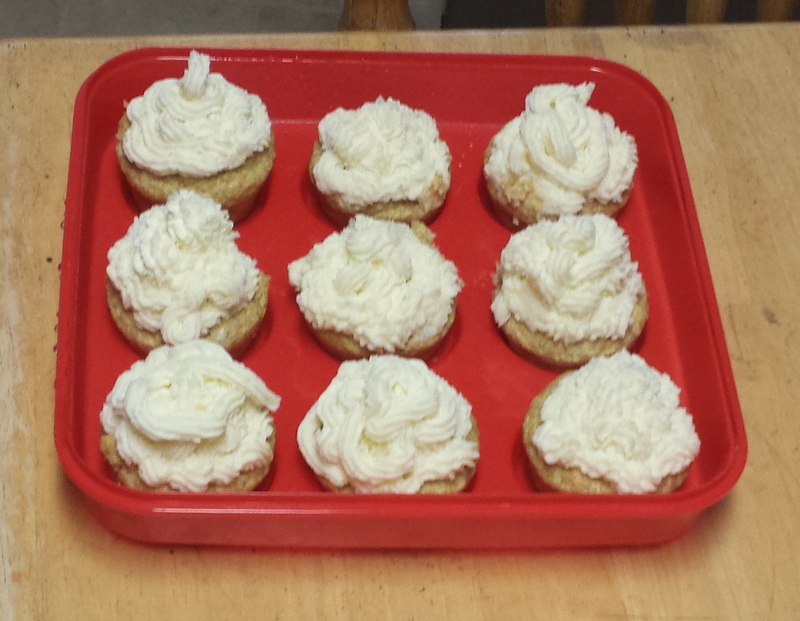 A more attractive presentation can be had by piping the frosting onto the cupcakes. Yes. I’ve already eaten three. I’ve had this with both the extra coconut extract and without. I can’t say that I like one better than the other. Each suits a mood. Sometimes I’d want the stronger coconut taste. Other times not so much.